And the big draw was the technical presentations by Van Council Salon, making it a can’t miss event. Challenge: We needed to pack in lots of details without creating a boring wall of words. Plus we needed to make it look interesting, because let’s face it, salon owners don’t do boring. Solution: Taking inspiration from Aveda’s latest collection of black and white photos, we used color very selectively, resulting in a high-end feel. 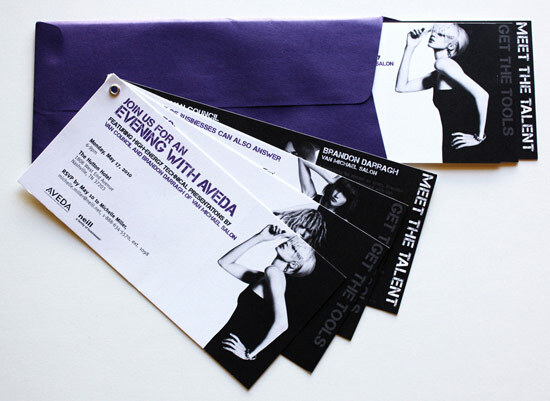 The purple envelope attracted interest, whether mailed, dropped off at the salon by the sales rep, or left on an owner’s desk. There was no mistaking this for junk mail! After dissecting the multiple intentions and writing copy, we broke up the information into four panels, all of which were grommetted together in the corner for a flip-through invite. Breaking up the info allowed us to make it more impactful, as each panel is really its own message with unique selling points. Results: The event was a huge success, and three years later, Nashville is now one of Aveda’s highest-yielding markets — all tracing back to one December night and a pretty cool invite. This invite won a Gold ADDY Award.